The all-new 2018 BMW M5 is here, and it's ready to challenge your preconceived notions about all that a luxury sedan can be. Outfitted with an incredible host of performance and safety features and an inspired engine, the 2018 BMW M5 is at once elegant but composed, edgy but refined. Your need for speed will be sated by the incredible power the 2018 BMW M5 provides. Thanks to its 4.4-liter V8 engine featuring M TwinPower Turbo technology, the new M5 will output 600 horsepower and 533 pound-feet of torque; improvements of 40 horsepower and 53 pound-feet of torque compared to the outgoing model. Drivers will be able to accelerate from 0-to-60 mph in just 3.2 seconds, and from 0-to-124 mph in just 11.1 seconds, making the BMW M5 ready for the racetrack. 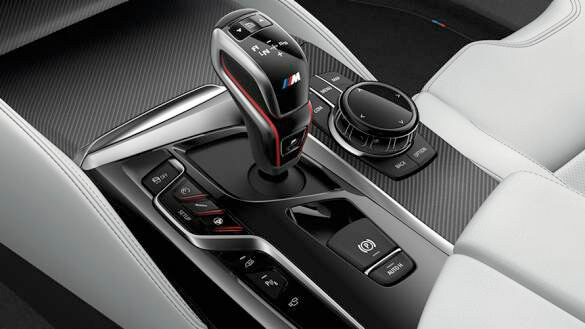 An 8-speed Steptronic® transmission with Drivelogic technology helps add to this high-performance sedan's sporty feel. Plus, drivers will have the ability to modify their sedan's performance by toggling between Sport Plus, Sport and Efficient driving modes. The all-new 2018 BMW M5 will also debut the M-specific all-wheel-drive system, M xDrive®. When the engine is first started, the all-new BMW M5 will be in all-wheel-drive mode (4WD) with Dynamic Stability Control (DSC) turned on. The driver is then able to vary the handling characteristics of the M5 by enabling various driving dynamics modes, including a rear-wheel-drive mode with no DSC. In this 2WD mode, the all-new BMW M5 offers drivers the opportunity to experience BMW’s traditional rear-wheel drive characteristics. The 2018 BMW M5 will also feature greater directional stability thanks to its increased track width and a five-link rear suspension that’s been modified to meet M-specific requirements. The electromechanical M Servotronic® steering delivers the right amount of steering torque, whether you’re taking your M5 for a trip around the track or on your daily commute. The all-new M5 isn't just impressive under the hood; its cabin was designed to make you look forward to every drive. Extended Merino leather comes standard in the 2018 M5, as do M Multifunction seats that offer greater lateral support and help to keep you comfortable no matter how hard you push your high-performance sedan. 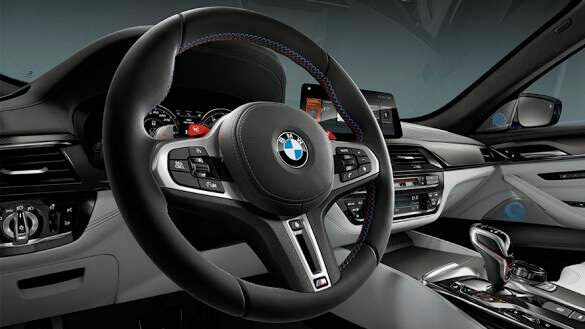 Two red-painted M1 and M2 buttons on the M multifunction steering wheel let drivers use individual set-ups to leverage M xDrive®, DSC, damper and steering characteristics and more. Plus, drivers can take advantage of an intuitive dashboard that provides key information and that makes it easy to use all of the technology packed into every 2018 BMW M5. If you want to be among the first to test-drive the 2018 BMW M5 when it hits our dealership, stay in touch with Herb Chambers BMW. We look forward to helping our customers get behind the wheel of the 2018 M5 when it becomes available early next spring.